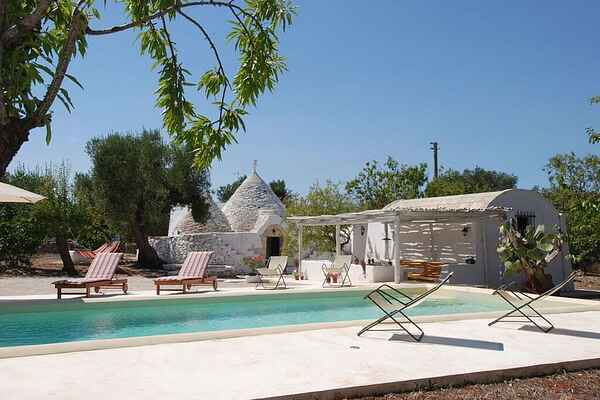 The trullo is a newly renovated charming complex of trulli with a private pool (12x6m) and outdoor barbecue. Inside the main trullo you will find a studio consisting of an alcove kitchen with a breakfast table, small sofa, a nook with a sofa bed for two, a bathroom and a storage closet with a washing machine. Set in the countryside with a panoramic view of the hills of the Itria Valley, Trulli del Mandorlo is located near the UNESCO site of Alberobello, seaside town of Monopoli and Polignano a Mare, famous caves of Castellana Grotte, beautiful hillside town of Ostuni. Beautiful charming holiday home, in a context of true and authentic Apulian tradition. You enjoy absolute peace and privacy. Ceglie Messapica is located in the province of Brindisi, on a hill, and is one of the oldest cities in Apulia. The old town is picturesque and consists of squares and streets of special beauty. Easily accessible is Ostuni, the famous white city, Brindisi and Martina Franca. About 40 km from the Safari Park Fasano for a trip outside the city and the beautiful seaside town of Costa Merlata is about 25 km.